Home Mobile Technology Take SM Cinema On the Go with New App! Take SM Cinema On the Go with New App! Your favourite cinema is now app-cesible! 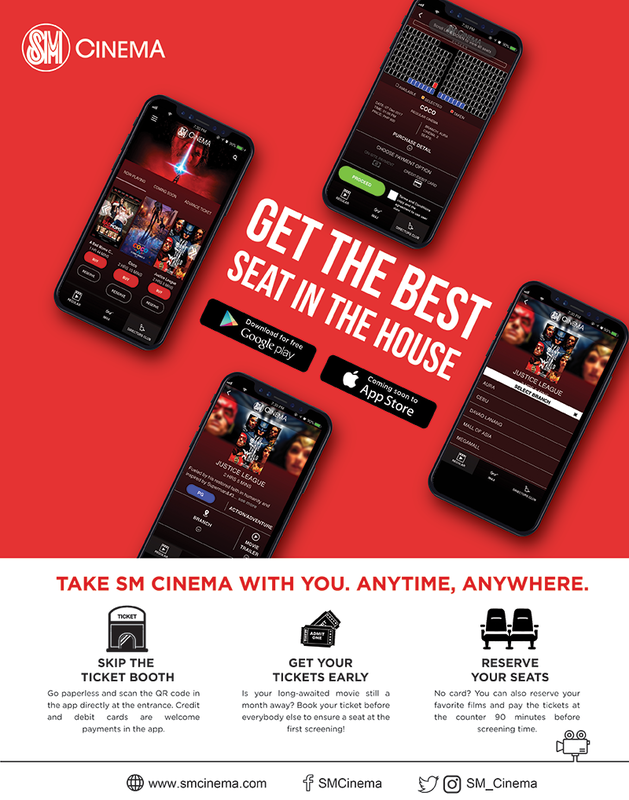 Skip the long lines and go straight to your movie – SM Cinema launches its free app for quicker reservations and paperless movie tickets. SM Cinema developed its very own app that allows you to find your preferred movie at the nearest theatre, reserve or purchase your tickets in seconds and directly enter the cinema through a QR code that you could scan at the gate. You can avoid arriving early, waiting in line, or printing your ticket at the booth and focus on the movie magic instead. Skip the ticket booth. Go paperless and scan the QR code in the app directly at the entrance. Get your tickets early. Is your long-awaited movie still a month away? Book your ticket before everybody else to ensure a seat at the first screening! Buy online. Lose the hassle of paying at the counter! Credit and debit cards are welcome payments in the app. Reserve your seats. No card? You can also reserve your favorite films and pay the tickets at the counter 90 minutes before screening time. Perks & Rewards: Enjoy special promotions and exclusive movie discounts using the SM Cinema App. Download link here for iOS - iTunes link. Download link here for Android - Play Store link. The app is now available for android users and will soon be available in iOS. SM Cinema lets you book anytime, anywhere. Download the SM Cinema app now at follow /SM Cinema on Facebook or @SM_Cinema on Instagram and Twitter for more details.